The company has cautioned that prior growth rates are going to be hard to top moving forward. Should investors be worried about a slowdown? Facebook's (NASDAQ:FB) 52% year-over-year revenue growth last quarter topped analysts' expectations and drove the share price up by about 10%. But deepeinside the company's comments on the quarter were words of caution from CFO David Wehner: The growth it's seen over the past year or so has been so strong that it's going to be tough to match moving forward. Remarks about tough comparables could be signaling a slowdown, but there are a few things to keep in mind as we approach the next quarterly report, due July 27. Since it went public in 2012, Facebook's growth has been atypical. 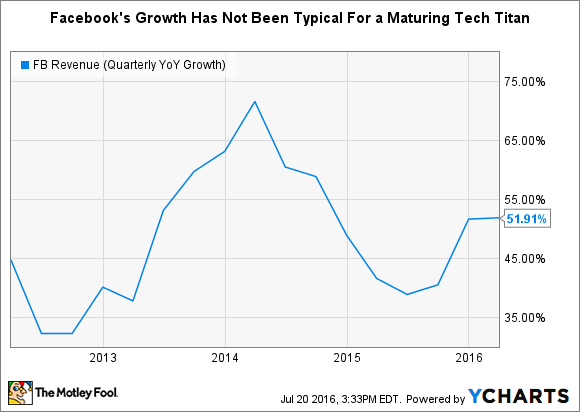 Usually, a tech company like Facebook will come on the market at a time of peak growth -- and frothy interest in owning a piece of it -- and investors will see a gradual decline to levels that are more sustainable over the long term. 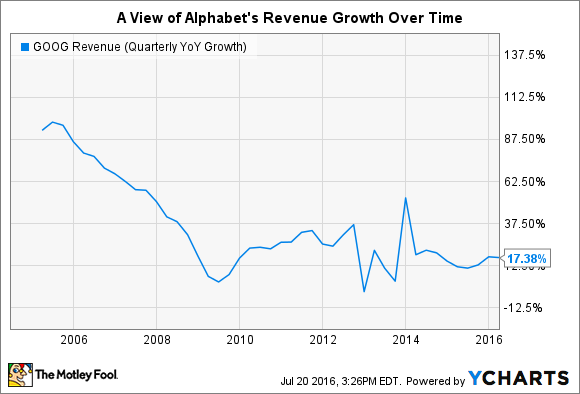 Consider Alphabet (NASDAQ:GOOG) (NASDAQ:GOOGL). Back when it went public in the latter half of 2004, the search giant then known as Google was generating better than 90% annual revenue growth. Within about two years, that growth had halved, and after two more, it had halved again. Last quarter, Alphabet posted growth of 17%. GOOG Revenue (Quarterly YOY Growth) data by YCharts. 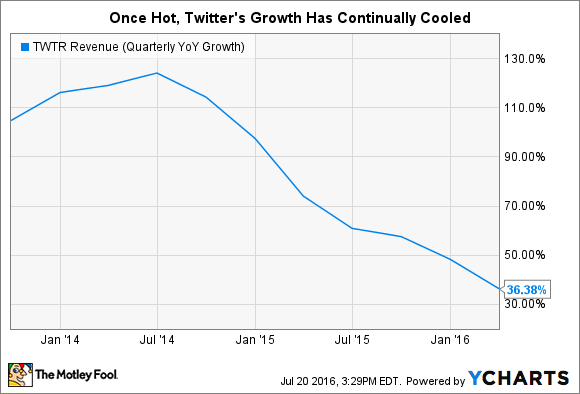 We've seen a similar storyline for Twitter (NYSE:TWTR), which was better than doubling annual revenue when it had its IPO in 2013. The most recent quarter's growth came in at 36% better than last year's, and analysts are expecting slower growth through the rest of 2016. Facebook, on the other hand, hit the market at a time when its growth had been slowing, tempering expectations. But it was also just beginning its efforts to build a powerful mobile platform for users and advertisers. The two surges in revenue we've seen since then are the product of ongoing investment in mobile and, more recently, video. FB Revenue (Quarterly YOY Growth) data by YCharts. Facebook has continued to build out a mobile platform that its users want to spend time on. The average Facebook user spends more than 50 minutes on Facebook, Instagram, and Messenger every single day. That's up from 40 minutes two years ago. And while its monthly mobile users have grown by 50% in two years, the number of users who access the apps only from mobile devices has just about tripled in that time. It's also been building out a better platform for advertisers, one that has market-leading targeting capabilities, as well as increasingly important measurement abilities to demonstrate to advertisers that they're getting a strong return on their investment. Last quarter, mobile advertising continued to roar ahead, up some 76% over the prior year and now generating more than four of every five dollars Facebook counts from the register. Its ongoing investment in mobile -- and mobile video -- should continue to pay off, and Facebook should continue taking share in the mobile ad market. This is not the first time Facebook has issued words of caution about its growth slowing. In fact, it was just a year ago that Wehner sounded a very similar alarm. Facebook had just recorded revenue growth of 39%, and the CFO warned about the possibility of "modestly" declining growth ahead. What's happened since? Year-over-year revenue growth rose to 41%, and then to 52%, where it's hovered for two consecutive quarters. It makes sense for Facebook to be conservative when looking ahead. Digital advertising is an industry always ripe for disruption. And with new entrants like Snapchat and Pinterest drawing attention from advertisers, and digital ad leader Alphabet continuing to makes strides in areas like ad targeting and measurement, the possibility remains that Facebook may see ad dollars drift away, at least temporarily. It's true that Facebook has a tough number to beat from the second quarter of 2015, when revenue growth rang in at 39%. But it should be clear by now that Facebook is guiding conservatively at a time when the company is firing on all cylinders. Wehner's cautious warning of tougher comparables should not be taken as a sure sign that growth is headed south, but an acknowledgement that tough comparables and a fast-changing ad landscape raise the odds of a disappointing quarter. More important for long-term investors: The factors driving Facebook's recent success remain firmly in place.